At Hilton Hotel Munich Airport, I am one of around 60 trainees, of which 20 started their apprenticeship with me last September. The chances that I will stick with this company after my apprenticeship are high: About 80% of all trainees get hired after their three years of training. I get trained to become a hotel specialist and have thus far worked in three different departments: as porter, stewarding and pool staff. The knowledge I have gained so far is pretty diverse. As a porter for example, I was in touch with many guests, when I was stewarding not at all, and now, during my time at the pool, it really depends on how busy it is. The guests who visit our hotel are very international. That’s not very surprising, considering that the hotel is located right by the airport. But the employees who work at Hilton Hotel Munich Airport are very international too: 37 nationalities from all over the world are represented here. That’s great, as I often find some colleagues to exchange a few words with in my mother tongue. 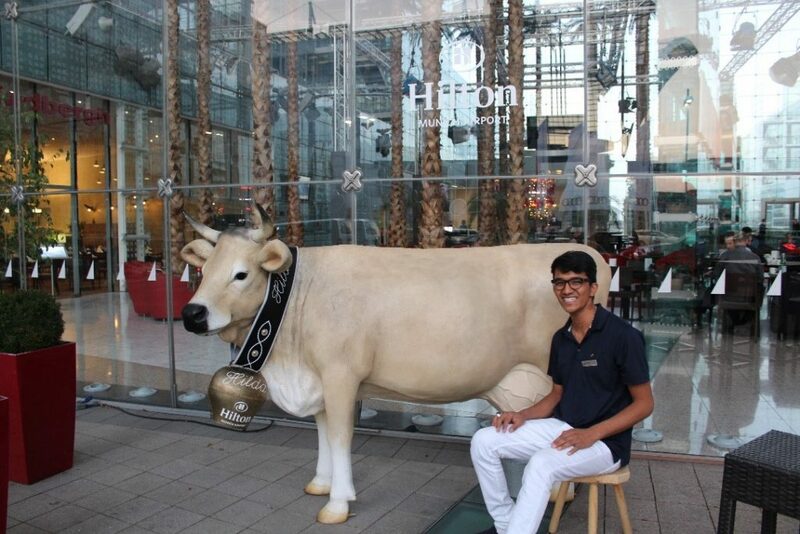 Here you can see me in front of the Hilton Munich Airport. When I worked as a porter, I especially liked to meet many Arab guests. During the Step-IN program my friends Zainab and Khaled from Syria taught me some Arab words. That way I could introduce myself to these guests in their own language. I think they were quite happy about it and it made them feel at home. I feel very comfortable at work; my colleagues are incredibly nice and at the beginning welcomed me warmly. At work, I like to take on any task that is requested, without complaining or questioning why. Just like I would do at home when I help my mum. Plus, I am here to learn, and trust me, I learn a lot! No matter which department I’m in, my experienced colleagues teach me everything. Maria, for example, is currently supervising my work at the pool. For two weeks we have been working together. I like to work here at the pool, as it’s a bit calmer than upstairs in the lobby, where guests constantly arrive and leave. When I start my shift in the morning I check together with Maria if everything is ok. We make sure everything is clean, fill up towels, drinks and fruits, turn on the sauna and check the temperature as well as the level of chlorine of the pool. It is important to check the chlorin content in the pools. Maria taught me how to do all of that. She taught me thoroughly. Sometimes, she explains so many things, that my head starts to hurt, and I get the feeling that I will have forgotten everything again by the end of the day. But I know that it is very important and therefore I try to remember everything. Because if, for example, the amount of chlorine in the water would be incorrect, it could influence the health of our guests. Therefore, Maria challenges me and asks me loads of questions to check whether I understood what I have to do. On Friday, I will do my shift without her being by my side and take care of all the tasks on my own. I am a bit nervous but also very happy that Hilton trusts me with that much responsibility. Many of our guests are on their way to the airport. Often, they appear to be stressed or in a great hurry. Sometimes, I find that difficult to handle. With strangers, I don’t always know for sure how to act. If I know a person well, I am very open and talkative. If not, I can be rather shy at times. But I’m sure that this is about to change soon. The latest, when I will start my shift at the lobby. For six months I will then be meeting new people every day, welcoming them to their stay at Hilton Hotel Munich Airport with a big smile on my face. I’m looking forward to it! “Compared to other trainees, Mojtaba had lower professional qualifications compared to someone who did his or her high school diploma in Germany, but Mojtaba more than compensated for this “lack” with inner competencies. There’s not a single day when I don’t see him with a big smile on his face – no matter if he’s dealing with guests or has spent the whole day in the scullery. His fundamental attitude fits the work in the hotel sector very well. He has a positive mindset and approaches new things with a smile. Others often experience difficulties if their idea and expectations of the job does not always coincide with the work they are undertaking. I myself completed an apprenticeship to become a hotel specialist when I was Mojtaba’s age, and I too was a little bit scared to work in the lobby at first. But the only way to approach stressed guests is to smile away negativity. As I have witnessed Mojtaba so far, I am sure he will master the upcoming challenges with flying colours. 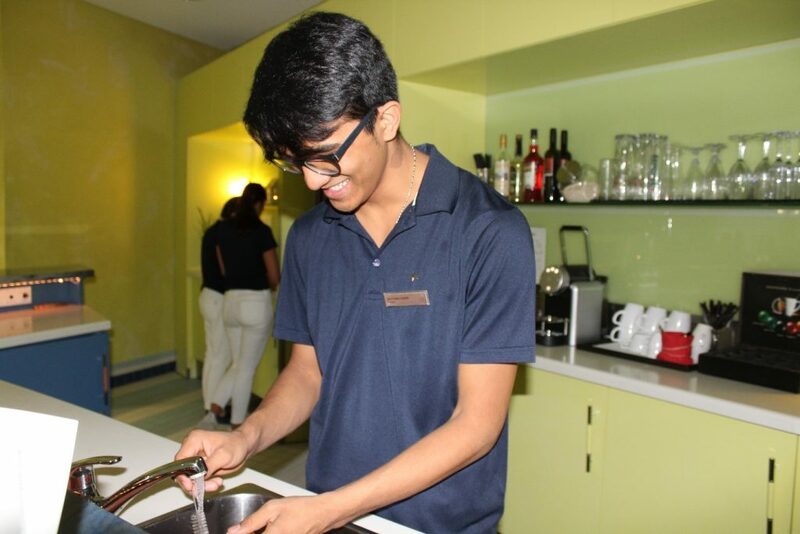 He is still at the very beginning of his journey with us at Hilton Hotel Munich Airport and there are many departments where I can imagine him ending up. But I am certain that he has chosen the right field of work and the right company for his apprenticeship. I see him being with us in the following year, but I also see him being with us in two and three + x years. Thank you for reading. I hope, I have given you a insight into my new life!